Mix together first nine ingredients in a medium bowl. Try to keep the mixture light. Break off about 1/12 of the mixture and flatten it out in your hand. Stick an olive right in the center. Form the meat mixture around the olive so the olive is in the center and held in place. Roll the ball in breadcrumbs and place it on a baking sheet or in a mini muffin tin. Repeat until you're out of the mixture. You should get about 12 large meatballs. Bake meatballs at 375°F for 25-30 minutes until they are cooked through and lightly browned. For sauce, cook onions in olive oil over medium heat for about 4-5 minutes. Then stir in spices and tomatoes. Bring to a simmer and cool for about 5 minutes. Add sauce to a blender and pulse until smooth. Serve eyeballs with sauce and toothpicks! When hunting ogres, it’s very important to make sure you use the whole animal. After all, slaying an ogre is an especially daunting task and to just take the most prized cut (The Ogre Sirloin) would be a huge mistake! One of the best snacks that the ogre has to offer is right smack in its noggin’. Forgotten for many centuries, baked ogre eyeballs used to be a real delicacy amongst the royals. Now you can make them at home! Ok. Obviously these aren’t really eyeballs. But they are kind of spooky looking! They’d be great for a Halloween party and they happen to be really tasty. To make these “eyeballs” you’re going to need some standard meatball ingredients: ground beef, Parmesan cheese, fresh herbs, eggs, and breadcrumbs. Mash this mixture together well with your hands. Try to mix up the ingredients but at the same time keep the mixture nice and light. Mix it just long enough to get the ingredients well incorporated. It might seem like a lot of work to stuff each individual meatball with an olive, but it really just adds a few seconds onto your prep time. Take a spoonful of your meat mixture (I like big meatballs) and kind of flatten it a bit with your palm. Then place the olive right in the center. Obviously try to keep the olive standing up so it looks like an eyeball, then just gently shape the meat around the olive. Don’t worry about getting it super-tight. The meat will shrink a bit as it cooks and get snug around the olive. 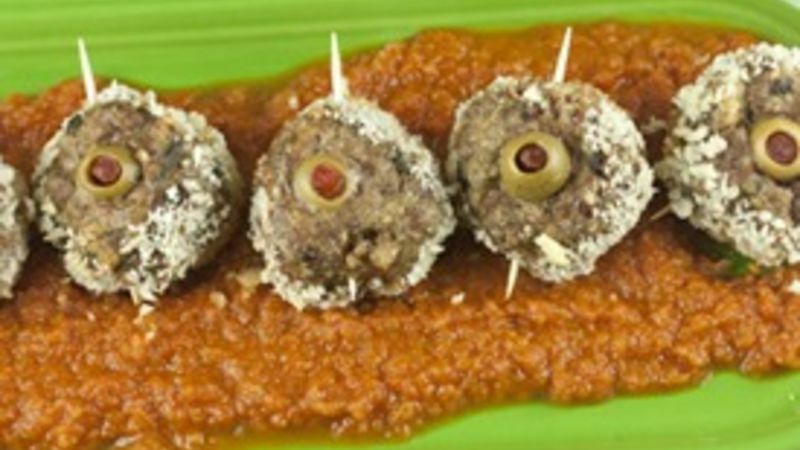 Once your olive is embedded in the meatball, roll the eyeball in some breadcrumbs. This gives them a great texture. When it comes to baking these guys, you have a lot of options. You could just bake them on a sheet pan or any baking dish, but my personal favorite way to make meatballs is to use a mini cupcake pan! The nice thing about using this pan is that the meatballs sit slightly above the tin so the grease can drip down and away from the balls. It also keeps the meatballs nice and round. Once all your meatballs are formed, bake them at 375 degrees for about 25-30 minutes. Meanwhile, mix up your bloody sauce! While you could use jarred pasta sauce for this, you might as well make a really tasty sauce since you have to wait for your eyeballs to cook anyway. I just cooked some onion in olive oil until it was soft, then mixed in some canned diced Muir Glenn tomatoes along with salt and pepper and some garlic powder. While you could leave it chunky, I recommend blending the sauce up so it looks more like blood and is a bit easier to eat. When your eyeballs are done, they should be nice and browned. Sometimes the olive gets squeezed so much while cooking that the pimento kind of pops out which is cool looking. Plate these eyeballs with a good layer of sauce and a few spears (toothpicks). These are obviously kind of a novelty, but they look really awesome in a darkly lit room (think strobe lights and fog machines). Beyond being scary though, they are actually just really good meatballs. Or umm… eyeballs. Nick takes Halloween very seriously. His best costumes include Richard Simmons, Bob Ross, and a Tetris piece. Check out his newly designed blog, Macheesmo, and connect with him on his Tablespoon profile. SPEAK UP: What’s your #1 trick-or-treat bag stuffer? Tell us!